Pinnacle Taekwondo in Sydney is the home of Local, State, National, International, Continental Champions as well as Australian Junior and Senior Representatives. Improve balance, co-ordination, flexibility, body image, short-term and long-term memory, develop breath control and learn to solve problems through the Taekwondo patterns. The Pinnacle coaching team and Black Belt Master instructors are renowned for coaching students to achieve their goals to excel and ambitions to be a champion. Pinnacle Martial Arts in Sydney caters for male and female of all levels and ages. We train beginners to black-belt and elite Taekwondo athletes. Pinnacle Martial Arts is a dynamic combination of selected effective techniques from various popular Martial Arts which translates into a comprehensive, exciting and effective style. Our Elite High Performance training program is geared for Olympic style Taekwondo competitions. The program is run by our coaches who are constantly up to date with the latest techniques, trends and training methods. Pinnacle’s objectives are to nurture our students in the right direction to achieve the highest possible peak that they can muster gaining the benefits that we believe will allow them to better themselves. self defence for teens in Marrickville Inner West Sydney, a combination of Karate, Taekwondo and Kung Fu self defence methods. 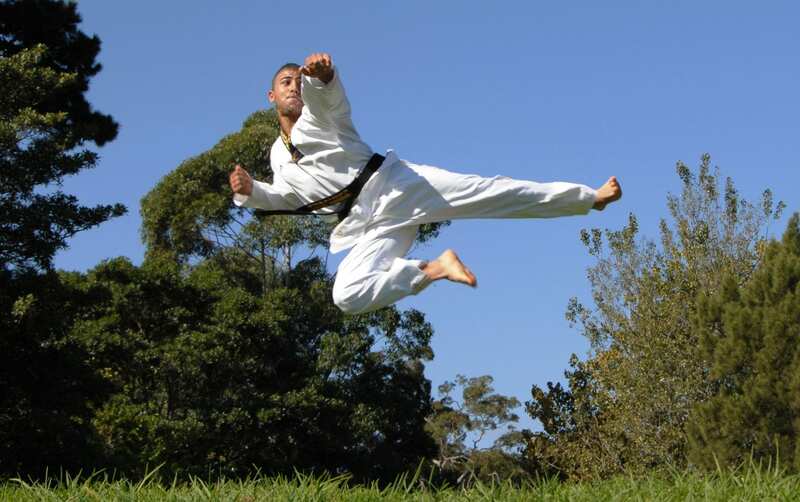 Taekwondo training generally includes a system of blocks, kicks, punches, and open-handed strikes and may also include various take-downs or sweeps, throws, and joint locks. Some taekwondo instructors will incorporate the use of pressure points, known as jiapsul, as well as grappling self-defence techniques borrowed from other martial arts, such as hapkido and judo. Taekwondo students should attempt to be polite to one another and to respect others. Students should address instructors as Sir and to bow to the instructors before and after classes. Turning up early or on time for classes is also an aspect of courtesy. One who has integrity is able to define what is right or wrong and have the conscience, if wrong, to feel guilt. Taekwondo students should strive to be honest and to live by moral principles. One of the most important secrets of becoming a leader in Taekwondo is to overcome every difficulty by perseverance. Without self-control, a Taekwondo student is just like any fighter in the street. Loss of self-control is disastrous both in sparring and personal affairs. “The term of stronger is the person who wins over oneself rather than someone else” – Lao Tzu. A true student of taekwondo will never give up, not even when faced with insurmountable odds. The most difficult goals can be achieved with indomitable spirit. Pinnacle Martial Arts Taekwondo Academy in Sydney is the ideal place to learn and progress to your own Pinnacle. We are here to Teach, Motivate and Inspire. Our Members travel to Pinnacle Martial Arts in Chester Hill and Marrickville to experience the Pinnacle of Martial Arts that is a unique mix of Taekwondo, Kung Fu, Boxing, Self Defence and Korean Karate. Pinnacle Martial Arts HQ is in Marrickville close to Dulwich Hill, Earlwood, Hurlstone Park, Canterbury, Summer Hill, Ashbury, Ashfield, Stanmore, Lewisham, Enmore, Newtown, Petersham, Sydenham, Tempe, Mascot, Alexandria, Turrella, Wolli Creek and Arncliffe.